We recently visited Paternoster and while there I had a delicious dish of homemade pasta sheets layered with chillies, bokkoms and toasted breadcrumbs. In fact I was so taken with the bokkom flavour, that I bought some to take home with me (vacuum packed to give our nostrils a fighting chance...). I confess, they were lying on the kitchen counter for a few days, staring at me accusingly, then I unceremoniously dumped them in the kitchen cupboard, for later usage. A few days later I started scouring the internet and racking my brain for risotto ideas and happened upon a recipe for a risotto with anchovies, mint and fried aubergines. And so I started thinking that bokkoms (at least to me) are somewhat similar to anchovies and wouldn't the preserved lemon that I made for the previous Daring Cooks challenge be a perfect complement to the flavours? However I had another hurdle awaiting me - the challenge demanded that we make our own stock. Yes, from scratch. At first I wanted to take the easy way out and make some vegetable stock. I really did not feel up to handling a chicken carcass. In the end though, I bullied myself into roasting a chicken (my first time) and making stock from the chicken bones and reserved skin. The things I do in the name of science... I stuffed the chicken with one of my preserved lemons which infused the whole bird with a deliciously lemony flavour. That was enough to convince me to make a lemony chicken stock too. It was a simple affair really - add chicken bones, reserved skin, remainder of preserved lemon (plus some extra) and the leftover chicken juices at the bottom of the roasting pan to a pot, add a roughly chopped carrot and celery stalk, some onions, a bit of salt and top up with water. And voila! In about three hours you have a flavourful chicken stock. And it makes your whole house smell pretty good too. As for the risotto - it was heavenly. The bokkoms added just the right note of saltiness and bite to the creamy risotto and the preserved lemon peel and basil delivered the final touches. I will admit that I never could understand the hype about homemade chicken stock, but I think it really made a difference in the end result. Bon appetit! 1. In a large saucepan, heat two tablespoons of the olive oil over medium-high heat, add the aubergine and fry until well browned and tender, about 8 - 10 minutes. Reduce the heat as needed to keep the aubergine from burning. 2. Heat the rest of the oil in a large saucepan, add the onion, garlic and bokkoms and saute for 2 minutes. 3. Add rice and stir for a few minutes to coat the rice with oil. 4. Add wine and bring to a boil over medium high heat. Stir constantly until all the wine is absorbed. 5. Add the chicken stock, a half cup at a time, stirring until the liquid is absorbed before adding more stock. The whole process will take about 20 -25 minutes for the rice to be cooked al dente. 6. Stir in the basil, butter and lemon peel. 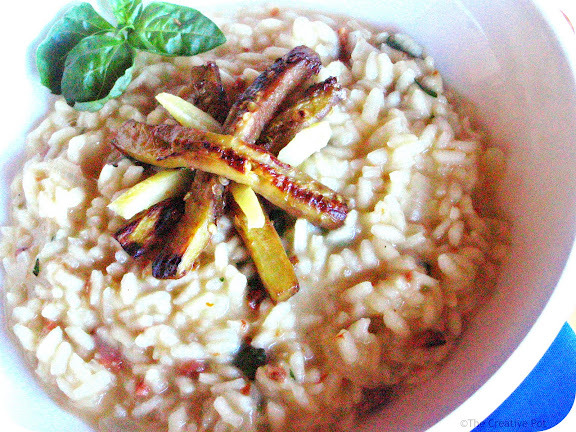 Spoon the risotto into individual serving bowls, and arrange the fried aubergine slices on top. Sprinkle with more basil and lemon peel if desired. Serve at once. * If you aren't lucky enough to be able to personally buy some bokkoms (dried salted mullet) on the West Coast of South Africa, I would imagine that you might be able to get away with using bacalao (dried salted cod). I have not tasted bacalao myself though, so you might want to use your own discretion on that one. Otherwise, use anchovies as per the original recipe. If I ever get to South Africa, you gotta make this one for me! This risotto sounds fantastic! I love the eggplant addition. I am deathly afraid of roasting my own chicken...never done it before...but you have definitely inspired me! Thanks to you I now know what bokkoms are. Your risotto looks great! Great job on your challenge and the risotto looks delicious. This looks wonderful! I'm particularly interested in the aubergine skins. Joanne: roast chicken is my ultimate favourite dish. And dead easy. You'll love it. Well done for putting your own unique SA twist on this Italian Classic!!! Counting the sleeps!!! Bokkom I have never hear of them but after a google search they are similar to anchovies so I bet your risotto was delicious and wonderful that you made the stock (and your first roast chicken) for the challenge it does seem you are learning a lot with the DC challenge. Cheers from Audax in Sydney Australia. Ap269 - Glad I could broaden your horizons. Do try them if you ever get your hands on some bokkoms. Adele - Aubergines are wonderful aren't they? Could eat them all year round. Nina - Thanks. Can't wait for Sunday! Audax - Thanks for stopping by, great to 'see' you again. This risotto look so irresistible Marisa. Love how your dress it beautifully with eggplant. Wonderfully inspiring. Going to Velddrif soon and looking for ways of cooking bokkom. Will try this one for sure.